March 26 2018. Posted in Arts & Crafts, Do-It-Yourself, Home Decor / Decorating, Mixed Media / There are No Comments - Be the First! Hi everyone! Pam here today!!! It has been awhile since I posted on the May Arts Ribbon Blog but it is time to share the “Love”! 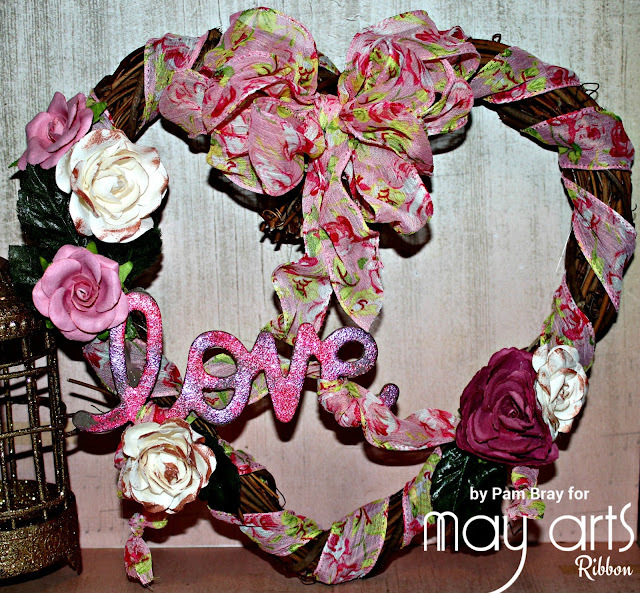 Today I am sharing a “Love” Wreath using May Arts Fabulous Spring Floral 1.5″ Ribbon. Begin by wrapping a 9″ heart wreath with the Spring Floral 1.5″ Ribbon. To form the bow…fold loop, twist at center and fold loop again. Repeat until you have 5 loops on each side. Emboss “Love” chipboard with embossing ink and embossing powder. Cut a piece of Spring Floral; Tie at both ends. Wrap around prepared “Love” Chipboard. About Joe Duffey: I work at May Arts Ribbon. I'm the song writer and singer in the band Underwater Window Garden, a baseball coach and a lover of all things creative. But most importantly I'm a dad to my 4 amazing kids.